A falavra chave é: Basta! The key word is: Enough! Portugal 2014 | 15:27, HD | Portuguese/English with sub-titles. A film by Julien Biere. Collaboration: Brigitte Weidmann. Animation: Nicolas Calderon. We don’t go and ask politicians. We don’t listen to the media. How do you experience the crisis, on a personal level and in your job? How can Portugal overcome the crisis? 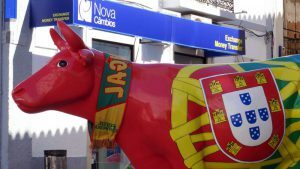 Portugal’s image abroad – is it correct? A snapshot on the height of the economic crises in 2013-2014. No later than two years after Portugal’s budget is again in accordance with the Maastricht criteria. Portugal’s economy is on a good way. Against this backdrop there was seemingly no need to continue this filmproject. At least, for the time being … Wir gehen nicht zu den Politikern. Wir hören nicht auf die Medien. Wie erleben Sie die Krise, beruflich wie privat? Wie kann Portugal die Krise überwinden? Hat das Ausland ein richtiges Bild von Ihrem Land? Eine Momentaufnahme auf dem Höhepunkt der Wirtschaftskrise 2013-14. Schon zwei Jahre später erfüllt Portugal wieder die Maastricht-Kriterien. Copyright © 2019 JULIEN BIERE. Alle Rechte vorbehalten.